Every year at the National Sports Collectors Convention, card manufacturers and other industry companies make exclusive cards specifically for the event. While these cards may be flying around the floor of the National, most dry up fast on the secondary market because so many collectors cannot attend the show. The 2011 National was the only place collectors found a licensed Kyrie Irving card from his rookie season. Today, raw copies of the card can sell for up to $60. 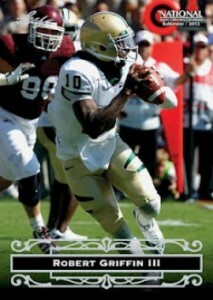 The 2012 National continues the tradition of exclusive sports cards. In fact, there are tons of different cards and programs to watch and plan for. 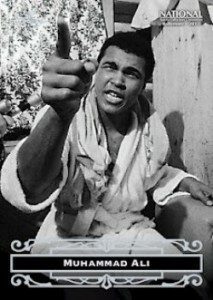 In the Game is producing a special Ultimate Memorabilia 11 SuperBox exclusively for the 2012 National. Each box comes with five packs of ITG Ultimate Memorabilia 11th Edition Hockey and an exclusive one-of-one autographed dual memorabilia card (click here for a checklist). The company is also running a redemption program for collectors who open select ITG products at the show. Those busting a box of 2011-12 ITG Broad Street Boys or one of the SuperBoxes will get a specially stamped one-of-one memorabilia card from the respective set. 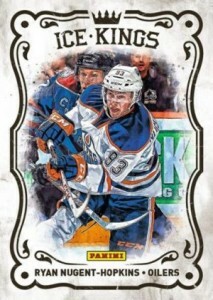 2011-12 ITG Between the Pipes breakers will also get a special game-used memorabilia card made just for the show. Collectors who open recent Leaf products at their booth will receive "Leaf Bucks" that can be spent at company's redemption store. Leaf Bucks can be used towards autographed football helmets, signed footballs and tickets to their autograph guests. Leaf is also making a 100-card set specifically for the National. They will also have autographed single all of which are numbered to 5 or less. Both will be available at the redemption store. Products eligible for the Leaf Bucks redemption program: 2012 Leaf Pop Century, 2012 Leaf Best of Baseball, 2012 Leaf Cut Signature Sports Icons Edition, 2012 Leaf Muhammad Ali The Greatest, 2012 Leaf Ultimate Draft Football, 2012 Leaf Valiant Draft Football, 2012 Leaf Football Autographed Mini-Helmets, and 2012 Leaf MMA Metal. Finally, for every 2011 or 2012 Leaf box collectors open at their booth, the company will stamp a special foil logo on one card. 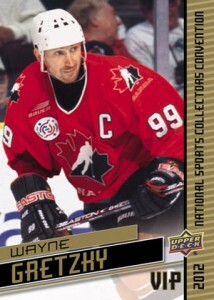 Onyx will be celebrating the release of their first full baseball card product at the 33rd NSCC. They'll be giving out three pairs of exclusive cards over the course of the show, two each for Thursday, Friday and Saturday. To get a pair of the cards, collectors have to break a six-box case of 2012 Onyx Authenticated Platinum Prospects at the company's corporate booth. Click here for complete info on Panini's wrapper redemption set. Each are done with a painted style reminiscent of the old Donruss Diamond Kings. Although Press Pass will not be set up at the National, they are offering a special offer with exclusive cards through select dealers. Those who buy an eligible NASCAR box from a dealer at the show will get a special Mystery Pack. 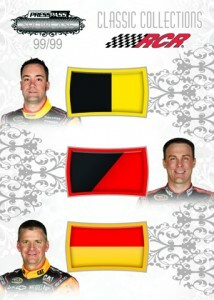 Each has a special multi-swatch 2012 Press Pass Showcase Racing Classic Collections card. The swatches are paired up by teammates. The packs also have an exclusive 2012 Press Pass Showcase parallel that is either autographed, numbered to 5 or a one-of-one. Each VIP goodie bag will have a Sportkings puzzle redemption. Collectors can take the card to the Sportkings booth a randomly receive nine random puzzle cards. This does not mean a complete puzzle though. 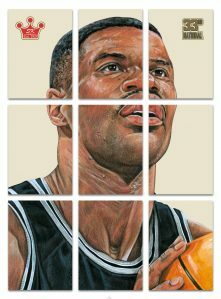 Sportkings is hoping their VIP cards will get collectors trading to finish their puzzles. Completed puzzles have nine cards, ideal for displaying in pages. 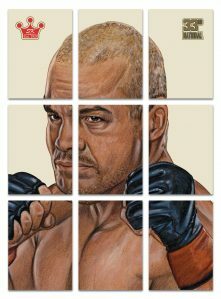 Each of the following have a puzzle: David Robinson, Gordie Howe, Gale Sayers, Bjorn Borg, Ken Griffey Jr, Franco Harris, Annika Sorenstam, Man O'War and Tito Ortiz. 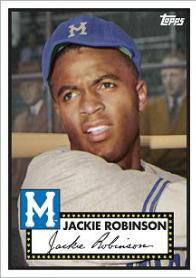 Topps has two redemption programs scheduled for the 2012 National. The first is a wrapper redemption for Gypsy Queen mini cards. 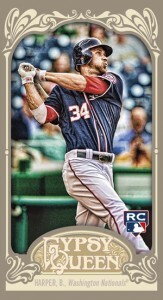 Collectors can get one of the nine exclusive cards by opening three 2012 Topps or Bowman packs at the Topps booth. Both MLB and NFL packs qualify. Topps has also produced an exclusive set of 25 numbered 2012 Bowman Platinum Blue Foil parallels. The only way to get these is to open a box of 2012 Bowman Platinum Baseball at the Topps booth. Click here for more details on Topps' plans. Topps has a five-card promo set for VIP ticket holders. 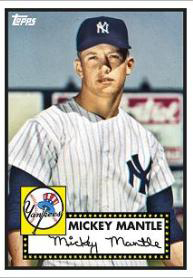 Done in the 1952 Topps Baseball design, the checklist include two different Mickey Mantle cards, Babe Ruth, Willie Mays and Jackie Robinson. All players are featured in minor league uniforms. 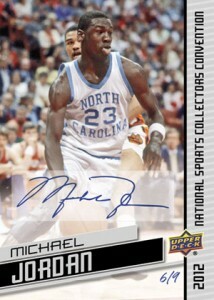 Upper Deck has created an exclusive set for the 2012 National. The cards will be distributed via special packs with a different assortment of players each day. Several high-end autographs will also be included randomly from such players as Michael Jordan, Wayne Gretzky, Robert Griffin III, Sidney Crosby and LeBron James. To get a redemption pack, collectors must buy five qualifying packs from an authorized dealer at the National. They will then be given a voucher that can be redeemed at the Upper Deck booth. Collectors are encouraged to check at the Upper Deck booth before making a purchase to make sure they're still in stock. There is a daily limit of five redemption packs per person. Upper Deck has a six-card set covering several sports for VIP ticket holders. 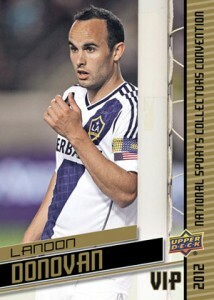 Included in the set are: Michael Jordan, LeBron James, Tiger Woods, Wayne Gretzky, Sidney Crosby, and Landon Donovan. Chuck (ID 50787) � Do you know which link you tried? I just checked a bunch and they were all fine. 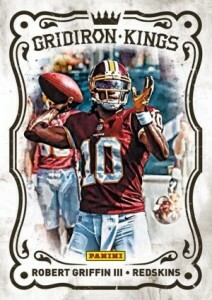 2012 National VIP PROMO #2 5 MADE ROBERT GRIFFIN III Redskins HOT ROOKIES RG3!! !